An overview of the coronary arteries. 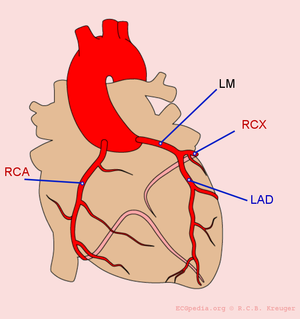 LM = 'Left Main' = mainstem; LAD = 'Left Anterior Descending' artery; RCX = Ramus Circumflexus; RCA = 'Right Coronary Artery'. Try to interprete this ECG using the 7+2 step method Look at the consecutive ECGs in this patient. Look at the consecutive ECGs in this patient. What electrolyte disturbance do you expect? Typical Brugada syndrome ST segments in right precordial ECG leads (on spot diagnosis) aka 'type-1 Brugada ECG' with 1st degree AV block and broad P-waves. A regular small-QRS tachycardia at about 300bpm with normal looking QRS complexes is most likely an Atrial flutter with 1:1 conduction over the AV node. Wide QRS Complexes in the Setting of Acute Myocardial Infarction: Good News or Bad? A Pre-excited Wide QRS Complex: is That all There is? And What About the ECG? Where Do the Extras Come From? The ECG of a (Cardio)myopathy? Nightly Phenomena, Day Time Work? In 2002, an a trial demand inhibited (AAI) pacemaker was implanted in a young male (born 1984) because of a primary arrhythmia disorder. Case: what kind of block? This Holter registration shows pauses. This ECG shows pauses in the heart rhythm. This tracing shows a pause in the heart rhythm. Sinus bradycardia, Second degree 2:1 AV block with LBBB in the conducted beats and junctional escape beats with RBBB morphology and fusion beats that mimic normal intraventricular conduction. Sinus rythm, 2:1 AV block with RBBB in the left part of the EKG and after a 1:1 conducted beat with LBBB the 2:1 AV block continues with LBBB. So it is a bilateral branch block. Sinus rythm, high degree AV block, conducted beats with RBBB and ventricular escape beats with LBBB image. Some fusion beats mimic no intraventricular disturbance confundinc as normal conducted beats. Sinus rythm, high degree AV block with unional escape beats and capture beats with RBBB. AV orthodromic tachycardia (WPW syndrome). Ventricular tachycardia or idioventricular rythm during sinus tachycardia with fusion beats. Escape rhythm with left bundle branch block pattern and likely retrograde conducted P waves. Complete AV block and left ventricle escape. Idioventricular rythm with 1:1 V-A conduction. Mobitz II AV block with LBBB in the conducted beats. Idioventricular accelerated rythm with fusion beats. AV nodal reentry tachycardia. Also look at the below ladder diagram. AV block with idionodal escape (the third P wave is inside the QRS). Sinus bradicardia and isorythmic nodal escapes. Coarse atrial fibrillation mimic atrial flutter. This page was last edited on 25 June 2010, at 21:22.